September 24, 2018 – The Landmark Mandarin Oriental, Hong Kong has started producing its own eco-friendly glass bottled water and is creating a rooftop garden to grow fresh food. Both initiatives form part of a long-term eco-strategy to provide guests with the best in sustainable luxury. 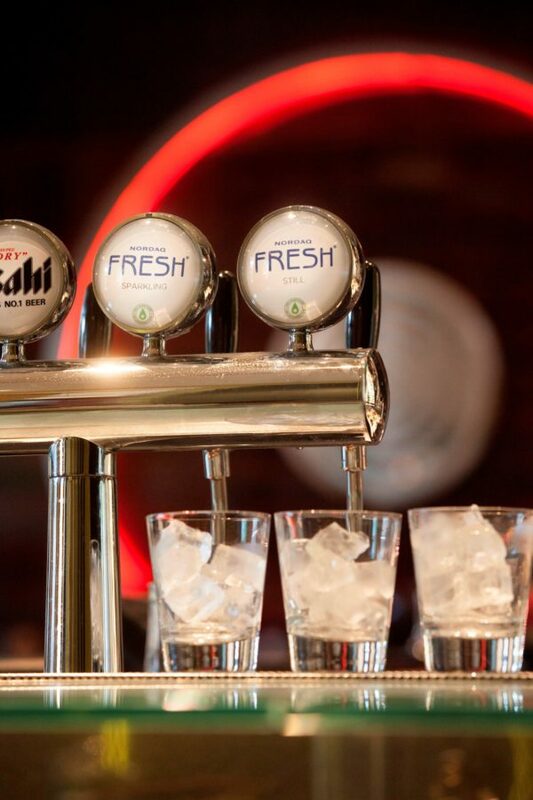 The hotel is the first in the city to partner with leading Swedish freshwater specialist, Nordaq FRESH, to introduce its own in-house, filtered and purified premium bottled water into guest rooms and suites along with bars, restaurants, and spa. Nordaq’s patented filtration system removes impurities from local tap water, while retaining natural salts and minerals, making it healthy, refreshing and balanced in flavour. This is served to guests “still or sparkling” in reusable glass bottles. Filtering and bottling on-site eliminates the need for single-use bottles and reduces carbon emissions generated by the traditional Hong Kong hotel approach of transporting bottled mineral water from Europe. When making trips out of the hotel, guests can use BPA-free compressive ‘Grab & Go’ impact resistant bottles or stainless steel alternatives and are encouraged to fill their bottles at the guest lobby ’s complimentary ‘central oasis’ water dispenser. In September 2018, the hotel will launch another new eco-friendly partnership, joining forces with the NGO Rooftop Republic to create a roof garden for growing fresh herbs, flowers, and small vegetables. Organic matter normally disposed of in landfill will instead be used as fertilizer. A rooftop beehive will provide delicious honey and wax for candles. “Considering our impact on the environment is a natural part of The Landmark Mandarin Oriental, Hong Kong’s culture and values. We are committed to reducing our carbon footprint and single-use plastic usage throughout the hotel” says Archie Keswick, General Manager of The Landmark Mandarin Oriental. The first hotel to ban plastic straws and use eco-friendly bamboo in place of the disposable plastic version in 2015. PDT, the hotel’s newest bar, features reconditioned and recyclable furnishings and provides reusable stainless steel straws for its exciting cocktails. Serving sustainable seafood at Amber and MO Bar, where even abalone shells are recycled. They are given to local jewellery brand, niin, to use in their designs. Chemical-free luxury shower gel, shampoo and body lotion in biodegradable containers are used at The Spa and Fitness Centre. The guest accommodation features ethically and sustainably sourced Cochine Saigon products. Eco-friendly detergents have been used for laundry since 2016. Recycling is encouraged throughout the hotels, including plastic, glass, metal and even soap, partnering with Clean the World. For more information and reservations visit www.mandarinoriental.com/landmark.